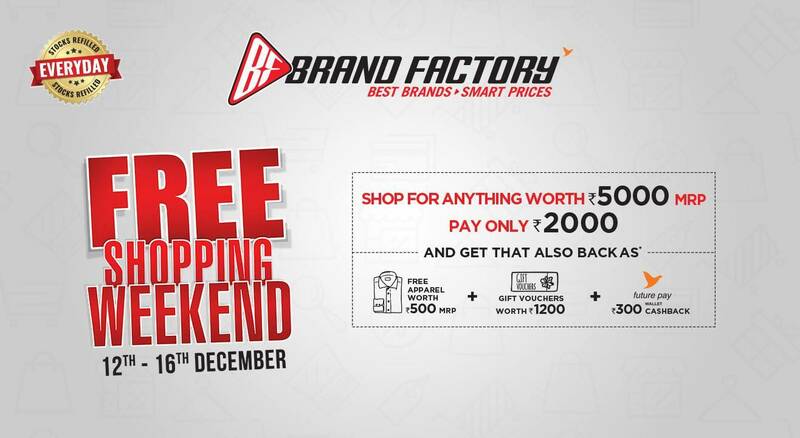 National, 12th December 2018: Brand Factory, the lifestyle discount store by Future Lifestyle Fashion is back with the much-awaited sale of the year, ‘Free Shopping Weekend’ from 12th to 16th December. After creating success stories with its previous seasons, the country will witness yet another edition of an exciting weekend with FREE shopping on 200 plus ORIGINAL brands. Brand Factory is giving an exciting offer where customers can shop worth Rs. 5000 and pay only Rs. 2000 and even get that back through gift vouchers worth Rs. 1200, apparel worth Rs. 500 and Rs. 300 cashback in Future Pay wallet, making shopping FREE! Customers can shop from over 200 plus original National and International brands like Lee Cooper, Levis, ONLY, Adidas, Reebok, Skechers, Fila, PEPE, US Polo, Crocodile, Buffalo, American Tourister, V.I.P, Holii, Lavie, Caprese and many more. Giving each customer a chance to shop with ease, the Free Shopping Weekend is India’s only wide-reaching ticketed shopping event. The tickets need to be pre-booked at a minimal cost of Rs.250 (Premium Passes for two: for early entry to the store from 8am) and Rs.100 (Classic passes for two: for entry post 11am). Like always this season of Free Shopping Weekend has lots instore for all brand conscious and fashion lovers. Customers can book their redeemable tickets on brandfactoryonline.com, insider.in or by visiting the nearest Brand Factory store. You can redeem the value of your ticket on your next purchase during 18th to 31st December. Book your tickets to the country’s mega shopping event soon! Brand factory is India's only discount fashion destination with over 86 stores in 37 cities. Brand Factory gives Indian consumers the promise of revolutionizing value shopping by offering the best Indian and International brands at Smart Prices. Brand Factory promises its customers, discount shopping at an undiscounted experience. The emphasis at Brand Factory is to offer customers the widest range of brands and categories possible at absolutely great prices in an ambience that befits the brand.